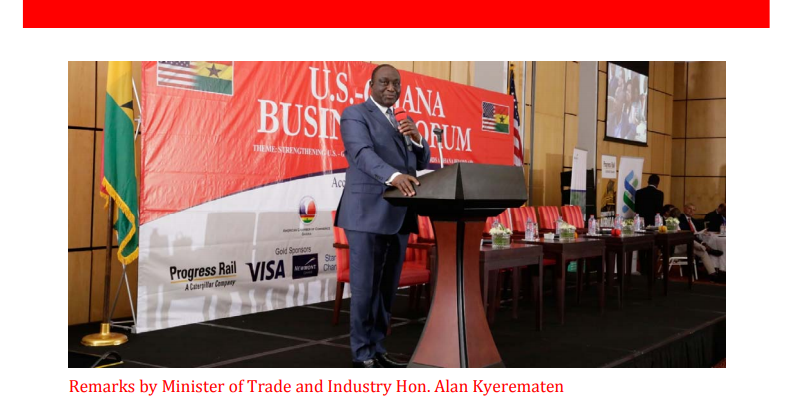 The maiden U.S.‐Ghana Business Forum was a high‐level meeting of U.S. and Ghanaian Businesses aimed at fostering and deepening bilateral commercial engagements between the two countries. The United States is one of the major trading partners of Ghana and the U.S. is among the top sources of Foreign Direct Investment into Ghana. 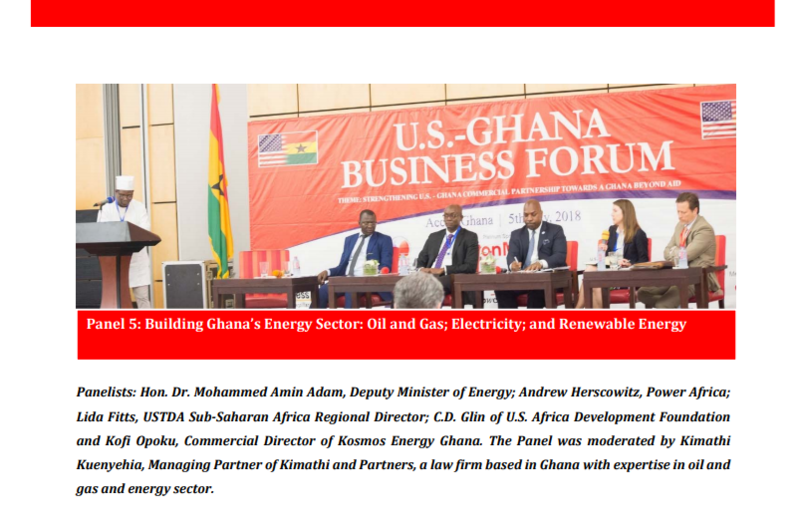 The 2018 U.S.‐Ghana Business Forum was on the theme: Strengthening U.S.‐Ghana Commercial Partnerships towards a Ghana Beyond Aid. The Ghana Beyond Aid Initiative, sees Ghana taking full ownership and responsibility for its economic growth and transformation, in a new partnership with the country’s partners through strategic and innovative domestic revenue mobilization as well as long term financing instruments to support economic development for higher productivity, jobs and inclusive growth. 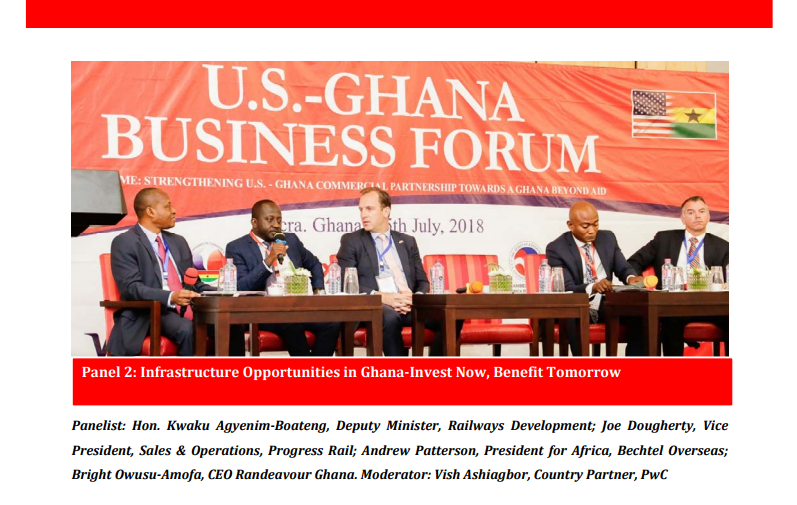 The forum strengthened trade and promoted business partnership opportunities between U.S. and Ghanaian Companies in infrastructure, railway, renewable energy and technology sectors. 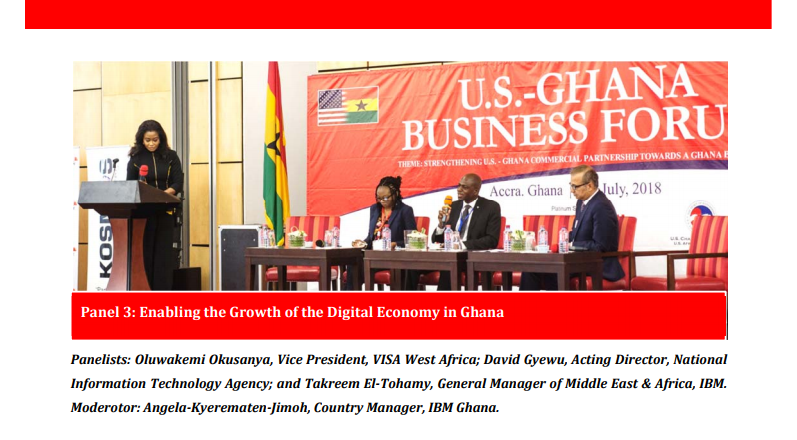 The maiden U.S.‐Ghana Business Forum was attended by senior government officials, influential business leaders, trade and technology experts and stakeholders to discuss trade and investment opportunities between the United States, Ghana and the African Continent. It served as a platform to explore new business opportunities and address regulatory challenges affecting trade and investment. Speakers at the Forum included the Vice President of the Republic of Ghana, Dr. Mahamudu Bawumia; Alan Kyerematen, Minister of Trade and Industry (MOTI); Secretary Wilbur Ross, U.S. Secretary of Commerce, and Jay Ireland, Chair of U.S. Presidential Advisory Council on Doing Business in Africa (PAC‐DBIA) as well as business leaders and other government officials from both countries serving as panelists discussing pertinent topics bordering on customs modernization, infrastructure, digitization, the capital market and energy. 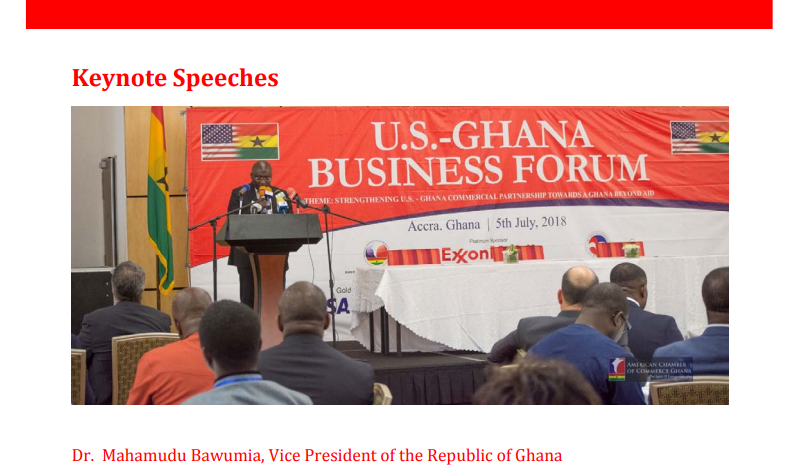 Dr. Mahamudu Bawumia, Vice President of the Republic of Ghana: Ghana and the United States have come a long way in business relations beginning from the establishment of the Associations of America Businesses and later the establishment of the America Chamber of Commerce in Ghana. Ghana has benefited from the activities of AMCHAM especially in the export of Ghanaian products to the U.S., as well as assisting government agencies market investment potentials of Ghana. Secretary Wilbur Ross: The United States is committed to being a strong, long term, and stable partner in Africa’s economic development. The U.S. wants to see all the governments in Africa improve their business climate, grow digital economies, create internationally competitive and productive agricultural, health care, energy, manufacturing and service sectors. The United States understands the importance of Africa’s 1.3 billion citizens to the global economy; its growth potential; and its influence on so many aspects of the daily international flow of goods and services. Hon. 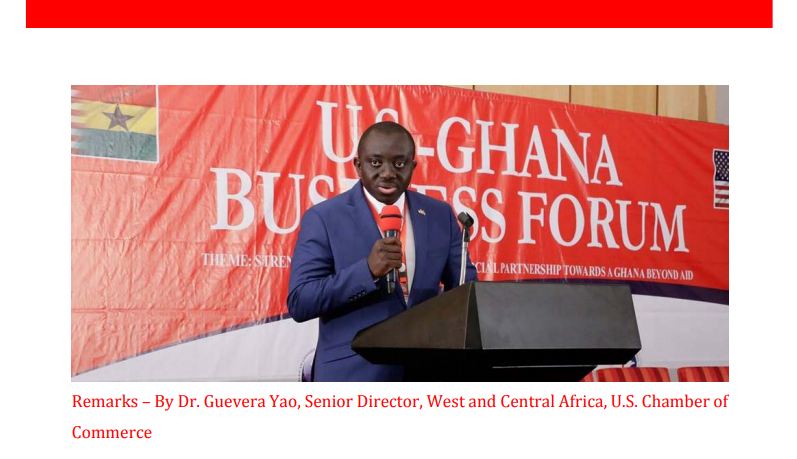 Alan Kyerematen: Minister of Trade and Industry commended the American Chamber of Commerce (Ghana), the U.S. Chamber of Commerce and the U.S. Department of Commerce for organizing the U.S.‐Ghana Business Forum which is expected to strengthen the already existing ties between the two countries and also provide good prospects for a more effective future engagement in trade and investment. 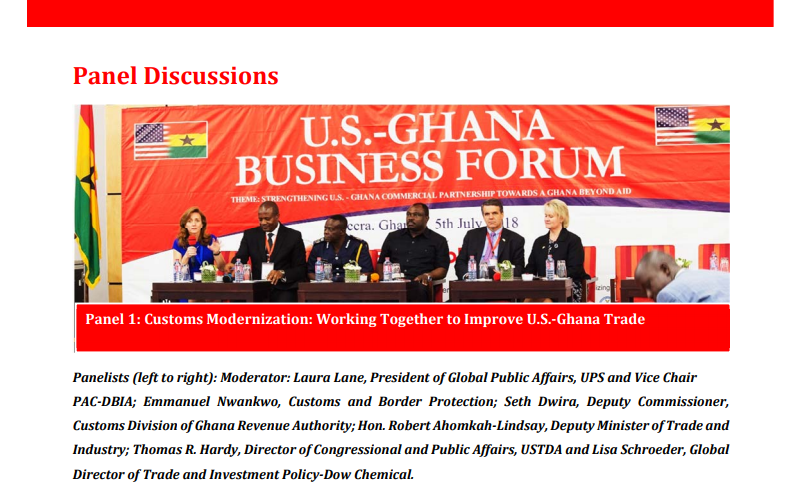 The United States and Ghana needed to capitalize on the opportunity of the Business Forum to forge a more mutually beneficial trade and investment relationship that is consistent with the realities of peculiar needs of both countries and in line with their global commitments. 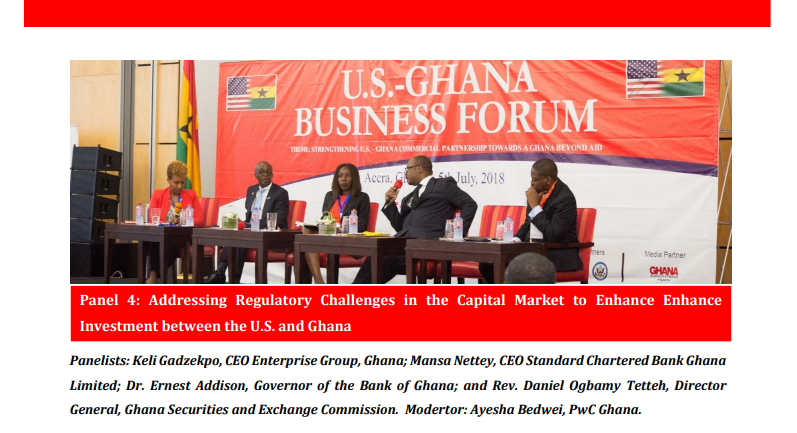 The maiden U.S.‐Ghana Business Forum provides a high and strategic level of engagement for U.S. and Ghana Businesses and Government Officials with the aim of fostering the business relationship that has existed between our two countries. The Forum must explore business potentials into concrete business transactions. 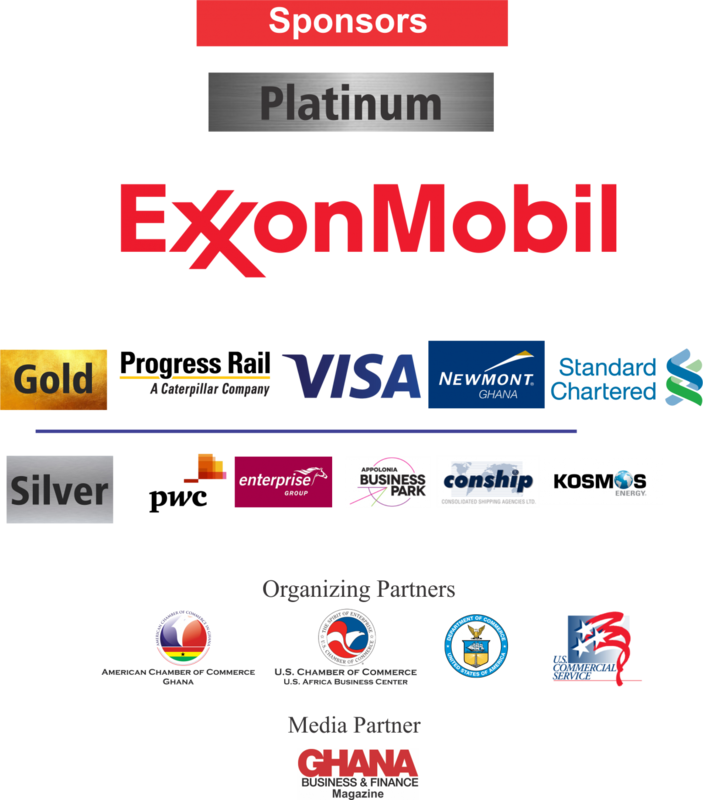 The success of U.S. Companies doing business in Ghana can be attributed in part to the formidable partnership and advocacy. Over the years the American Chamber in Ghana has built strong relationships with government and private sector stakeholders, advocating for improved business environment in this country. 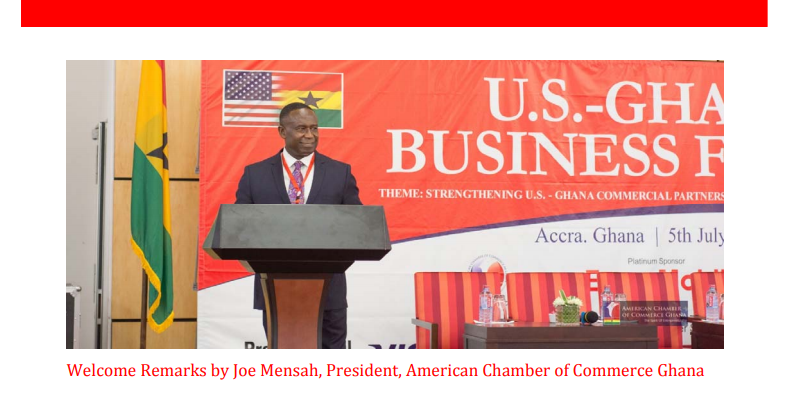 The American Chamber of Commerce in Ghana is one of the leading and active business chambers providing its members with responsive services and catalyzing policy reform discussions through active engagement with stakeholders at all levels. Your Excellency Mahamadu Bawumia, Vice President of the Republic of Ghana, the Honorable Wilbur Ross, Secretary of Commerce of United States of America; the Honorable Ambassador Jackson, Ambassador of the United States of America to Ghana, delegates of PAC‐DBIA and distinguished guests, it’s a pleasure to join you here today as we commemorate Secretary Ross’ visit to Ghana and highlight the great opportunity available in this country. 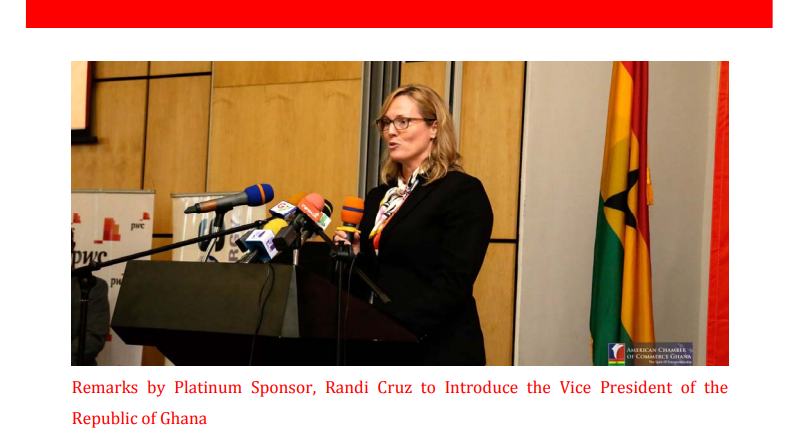 I am Randi Cruz, the recently named and appointed Director and Venture Manager of ExxonMobil’s anticipated operations in Ghana. I really look forward to getting to know not all of you but some of you. Dr. Guevera Yao, Senior Director, West and Central Africa, U.S. Africa Business Center: The U.S. Chamber of Commerce sees Africa as a vibrant and growing market, with business opportunities in virtually all sectors, including Infrastructure, energy, health, agriculture, ICT and financial services. Africa is the fastest growing population in the world, with an estimated 2.5 billion people by 2050, and households and business expenditures set to hit 4 trillion a year USD by 2025. With an emerging middle class demanding more and more quality manufacturing products and services, we see Africa as the continent of the future, with great opportunity for U.S. Companies. 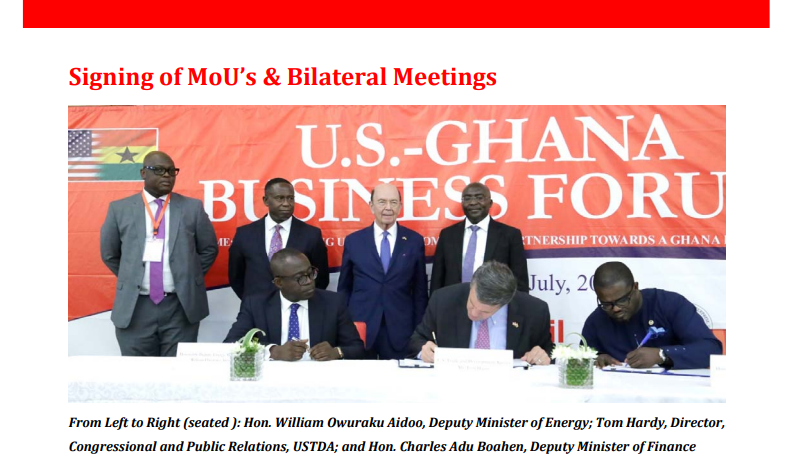 In Ghana, the U.S. Chamber has a long‐standing commitment to establishing greater commercial ties between the U.S. and Ghana. Over the last decade the U.S. have been excited to see the progress made by Ghana. 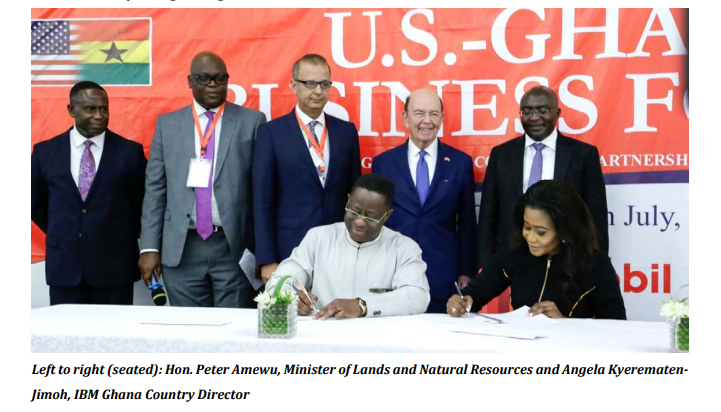 USTDA and Ministry of Energy through the Ministry of Finance signed an MoU to provide a grant to Ghana to help extend electricity through mini grids to 67 communities in Afram Plains in Ghana. IBM and Ghana’s Ministry of Lands and Natural Resources signed an MoU to use blockchain technology in Ghana’s land administration.